Line and define your eyes with Stila Stay All Day Waterproof Liquid Eye Liner; the brand's number one selling waterproof liquid eyeliner. 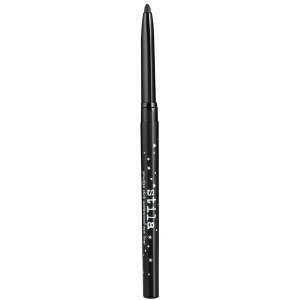 Equipped with a fine, marker-like top for precise, fool-proof application, the quick-drying liner glides on effortlessly, laying down high-impact pigment that won't smudge or run. From fine lines to thick, dramatic flicks, the waterproof eyeliner delivers intense, long-lasting results for show-stopping definition. Water/Aqua/Eau, Styrene/Acrylates/Ammonium Methacrylate Copolymer, Butylene Glycol, Beheneth-30, Caprylyl Glycol, C11-15 Pareth-7, Disodium Edta, Ethylhexylglycerin, 1-2-Hexanediol, Pentylene Glycol, PYP, Sodium Laureth-12 Sulfate, Sodium Polyaspartate, Tetrasodium EDTA, Phenoxyethanol, Potassium Sorbate. (+/-) Black 2 (Ci 77266) (Nano), Iron Oxides (Ci 77491). <Iln C171073>.